Seems like a full on frontal attack took to the trailer hitch industry a few years ago and them WHAM… nothing. There where half a dozen new offerings from all and sundry who attempted the age old problem of hitching up trailers and caravans to their prime movers. Some were brilliant, some half-hearted, while some others kept (secretly) hammering away at the brain cells to come up with an even better and simpler way of achieving a seemingly simple task. McHitch where indeed one of the many and more successful that released the UniGlide offroad coupling, to which there have been minor improvements resulting in the current Platinum Series, which also boosts a plethora of adaptors to engage with Treg, Trigg and AT35 couplings. 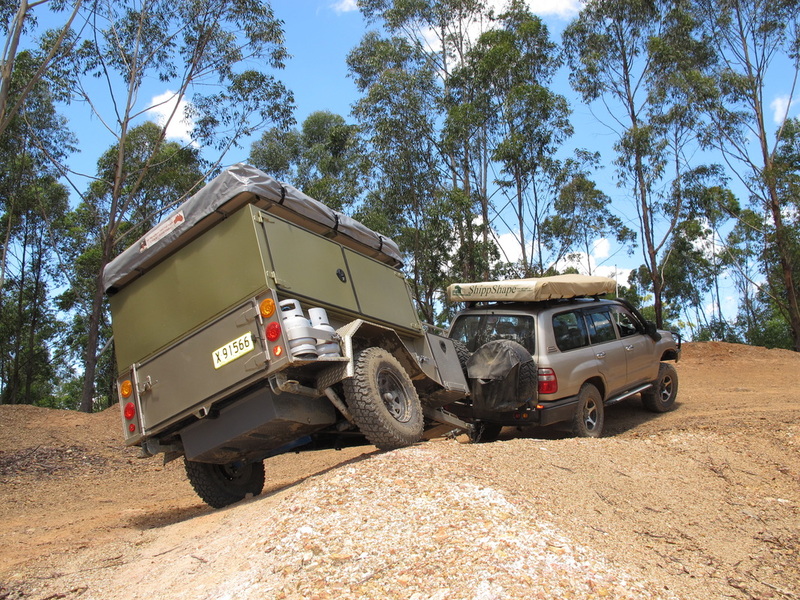 Step forward a handful of years and the launch of the equally impressive, world first all-terrain ‘Automatic Trailer Coupling’; yep, that’s right, the process of hitching your trailer or van to your tow vehicle is done automatically… to an extent. There are a few extra steps that need to follow that do require you to dismount your stead and manually execute. To give some idea of the magnitude and significance of the project, Joe McGinnes (McHitch) was recently awarded multiple times at the Las Vegas SEMA show. The ‘McHitch’ name is a combination of the creators name (Joe McGinnes) and the word ‘hitch’ – McHitch, so no, it’s nothing to do with any burger chain. With the removal of my old offroad hitch, the new Automatic Trailer Coupling (ATC) was a simple bolt on affair to my camper trailer. The opposing end was just as simple with the removal of the old hitch receiver and bolting on the receiver portion of the ATC. All that was left to do was reverse into the trailer. The release leaver simply drops into position and you could literally drive away, trailer in tow. Obviously, the jockey wheel has to be wound up, electrical plug plugged in, safety chains attached and the two safety mechanisms of the ATC engaged. In reality, the idea behind this trailer attachment is nothing new. Looking at the trucking industry, you’ll note that pretty much all ‘Dog’ and ‘Pig’ trailers are hitched via a similar mechanism. What Joe has done successfully is refine the idea to rid all rattles and coarseness to deliver a user friendly version to the car and 4x4 industries. There are no sloppy or loose fittings akin to the truck versions, plus Joe has gone the whole hog and had his system ADR approved and has kits from 2 tonne ($350.00), 2 tonne with brake override ($350.00), 3.5 tonne ($395.00), 4.5 tonne and 6 tonne ($595.00) for the caravan and light trucks. Handbrake kits are also available for most of his kits. With our trial ATC and McHitch handbrake kit in place on my offroad trailer, we figured it was time for a 3 day family camping trip. Nothing to arduous off road initially, merely to test the system with respect on-road smoothness, plus ease of connection in an easy to use environment. Big ticks there, and yep, we had many ‘double-takes’ as fellow campers wondered past; obviously no one has seen this hitch as it is that new to the market. Next up was to tackle a few offroad obstacles as well as unhitching and re-hitching the system in awkward positions – one sure thing some other hitches simply can’t handle without a gob full of obscenities thrown in. All up, I’ll give the system double thumbs up for ingenuity, ease of hitching / unhitching in all terrains as well as how well it allows the trailer to move unhindered offroad, plus the price is right compared to most others on the market. Obviously the automatic system will only work if the horizontal pin is within the receiver plate range. Outside of that range will necessitate the user to adjust either or both the height of the trailer (via the jockey wheel) and / or the alignment of the trailer to allow proper engagement. Given you still need to wind the jockey wheel up, plug the electrical leads in, attach the safety chains and connect the two safety mechanisms of the ATC, this, in effect, partially negates the pros for the automatic part of the system. In reality, you can’t simply reverse, auto hitch and drive away, so at the end of the day, the system may save a few seconds each time hitching and unhitching takes place, but, for mine, I’d be happy with a ‘drop on’ system more akin to the McHitch Uniglide Platinum system. It has the same universal swivel system via a universal joint, but simply lowers (via the jockey wheel) onto a vertical tow pin. Also, you do need to be careful when reversing into the hitch to engage (or hitch up) that you don’t bump your trailer too hard, resulting in it moving. The handbrake fully on and perhaps chocking of the wheels would be a good idea. The only other gripe is that although there is no greasy towball to drag your clothes or leg on, there is a potentially painful handle that could take a fair chunk of skin out of a leg. Fair enough it does fold away in one direction, but catching yourself in the opposite direction will end in tears. When we mentioned this to Joe, he informed us of an upgrade rubber cover for the release handle, so at least he’s on the same thought waves as us. Click HERE for the video on 4x4 Australia's web site.